The court ruled to reduce Jafarov’s original 6 ½ year sentence by 3 months, bringing it to 6 years and 3 months. On July 31, the Baku Court of Appeal heard the appeal of human rights defender Rasul Jafarov. Judge Hasan Ahmadov presided over the hearing. Unlike the previous hearing, which had been partly closed, local and international observers, journalists and community members were able to attend. During the hearing, lawyer Fariz Namazli filed a motion to drop the charge under Article 213 and to release Jafarov from criminal responsibility. The lawyer told the judge that Jafarov had paid the tax debt incurred, and thus in accordance with the criminal procedure legislation, should be released from responsibility. 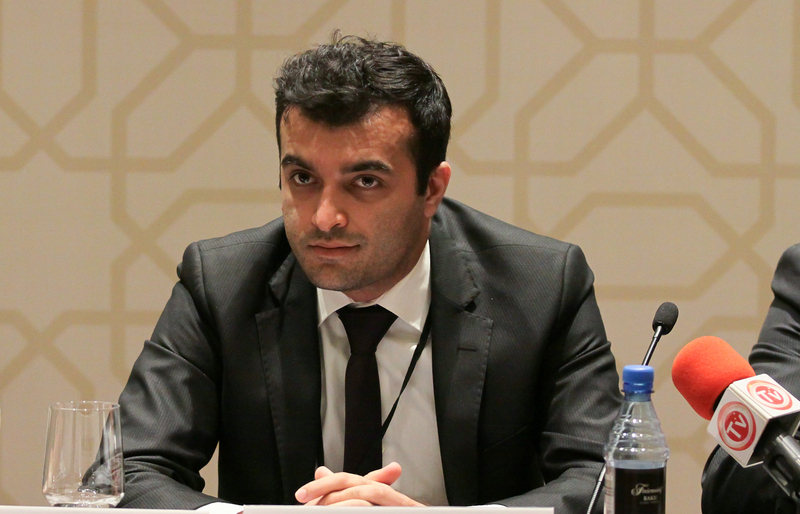 Rasul Jafarov and the victim, Ahmad Heybatov, also supported the motion. The judge said declared that he would assess the motion at the end of the hearing. Rzayev noted that for the misappropriation charge to be valid, a victim is required – but the donor organizations that provided the funds along with all the people recognized as victims by the investigative agency have testified stating that they have not suffered any damage. The lawyer asked the court to acquit Jafarov of all charges. The court then heard from lawyer Fariz Namazli, who stated that the defense had set forth in detail the full scope of the legal arguments pertaining to the appellate complaint. The lawyer added that other persons arrested on similar charges have been released on parole, and that the court’s refusal to apply this measure in Jafarov’s cases constitutes discrimination. Rasul Jafarov commented on his decision to pay the tax bill. He noted that he paid this bill in order to secure his release from criminal responsibility, but also to show himself willing to engage in a dialogue with the authorities. “I took this step and offered my hand out, and I expect the opposite party to respond with a similar gesture. The Ministry of Taxes has also issued a decision on the payment of the tax, which we have challenged in court and the case is underway. In addition, I’d like to call your attention to a few points. One of the most disgraceful charges brought against me is the misappropriation charge, because the funds in question were transferred to my account by a number of different international organizations, and when the investigating agency was investigating the case, at least five of those donors remained in Azerbaijan: the OSCE Baku Office; the Delegation of the Council of Europe; the Representative Office of the Open Society Institute; and the British and Norwegian Embassies. The investigating agency failed to approach these bodies to ensure a fair and objective investigation of the case, but they failed to do this. Nor were the documents that we presented assessed as part of the investigation. We provided, for instance, notarized letters sent by donors and documents showing financial expenses. Furthermore, the investigative agency has stated that the Human Rights Club operated without registration and that the grants that we had received were not registered as required by national regulations. On this question of law, the chairman of the Council of State Support to NGOs, MP Azay Guliyev. stated an interview that NGOs can function without registration. Additionally, when answering the questions of the European Court of Human RIghts in Ismayilov vs. Azerbaijan, the government of Azerbaijan noted that an NGO can function without registration. The law was only changed in December 2013, following which the organization’s activity was halted. As for the grants, they had been sent for registration – and it is clear that the Ministry of Justice had that information; otherwise, how could the criminal case against me have been launched based on information provided by the Ministry of Justice?” Jafarov told the court. Ahmad Heybatov, who has been recognized as a victim by the investigative agency, has also submitted an appellate complaint. Speaking in support of his submission, he said that he does not consider himself a victim and does not understand why the investigative agency has recognized him as such. He asked the court to overturn the court’s 16 April 2015 judgment and to acquit Rasul Jafarov. Public prosecutor Seyhun Azadaliyev stated that he rejected the defense’s arguments. He told the court that the evidence presented to Baku Grave Crimes Court had been evaluated by the court in its verdict and therefore, as the arguments of the appeal were unfounded, the judgment passed on Jafarov was correct and should be upheld. However, Azadaliyev did ask the court to drop the tax evasion charge against Jafarov in accordance with national legislation, following the full repayment of damages. The court amended the verdict passed on Rasul Jafarov, dropping the tax evasion charge (Article 213 of Criminal Code) and reduced his sentence by 3 months, bringing it down to 6 years and 3 months. Rasul Jafarov was arrested on 2 August 2014 and charged under Articles 192 (illegal business activity), 213 (tax evasion) and 308 (abuse of official powers) of the Criminal Code. On October 23, his pretrial detention term was extended for 3 months. On December 12, new charged were brought against him under Articles 179.3.2 (misappropriation) and 313 (service forgery) of the Criminal Code. Jafarov was sentenced to 6 years and 6 months in prison on 16 April 2015. Amnesty International has recognized Rasul Jafarov as a prisoner of conscience.